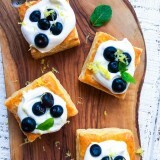 Flaky puff pastry is filled with a creamy, lemon yogurt mixture then topped with whipped cream, fresh blueberries and mint. 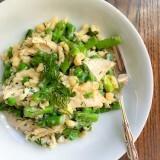 Homemade dumplings, fresh spring veggies and roast chicken are tossed in a light, creamy dill sauce. 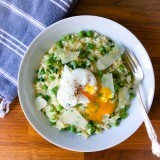 Fresh spring peas, green onions and Parmesan cheese flavor this light and creamy rice dish.